Earlier this month George Bush traveled to Guatemala in an effort to spread the good cheer and convince Central Americans that CAFTA actually is going to benefit them. It seems that his presence was less than appreciated by the Mayan community, who reportedly planned to cleanse the sacred site at Iximche after Bush visited it in order to get rid of any bad spirits he may have left behind. Although George Bush may not be welcome here, OTR travelers have been embraced with open arms at Mayan sites. 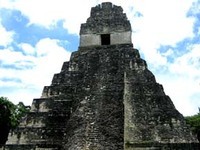 If you plan to travel to Guatemala, be sure to check out our local recommendations and advice.